I meant to write separate posts for each one but I’m feeling fluey today and so I’ll just combine them in this one post. Top Hat is a new musical in West End, having just started its run this year. It’s an adaptation of the 1935 film of the same name that starred Fred Astaire and Ginger Rogers. It is a romantic comedy involving mistaken identity and features quite a bit of funny, witty dialogue. The story is suited for the stage, I think. It isn’t dependent on special effects or anything crazy – it’s all about the dancing and the dialogue. And singing. But the songs aren’t totally memorable, which I somehow expected, since Fred Astaire was more dancer than singer. I thought the singing was decent and the dancing was pretty good. Production design and costumes were your typical West End-level: good. Nothing spectacular (because the story doesn’t require anything magnificent, really), but good. I did rather like how they staged the scene where Dale Tremont can’t go to sleep because Jerry Travers is tap-dancing in the room above her – with Jerry dancing on the main stage, and part of the wall swings around to reveal Dale in her bed glaring angrily up at a silhouetted “Jerry” figure doing the same dance on a stage above her head. Clever. I enjoyed it, despite having to fight severe jet lag symptoms. (I think this was the first time I’ve experienced real jet lag…) The story isn’t the most riveting, but the amusing dialogue and the enjoyable dance sequences kept my interest. Singin’ in the Rain is a “revival” in West End – it was first stage in 1983 (according to Wikipedia) and ran until 1985. It hadn’t been staged in West End since then until this year. 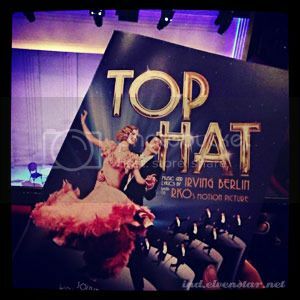 Like Top Hat, this too is an adaptation of a movie musical of the same name – one that starred Gene Kelly and Debbie Reynolds. (It is also probably my favourite movie musical, and is Jemma’s favourite movie of all time. haha)Singin’ in the Rain tells the story of film stars in the age of silent movies and how they deal with it when the “talkies” are introduced. It featured all the songs I remember from the movie (except for one), and that was delightful. Adam Cooper doesn’t have quite the same charm and graceful ease that Gene Kelly had, but then who does? Mr. Cooper does a creditable job as Don Lockwood, nevertheless. Scarlett Strallen looked remarkably like Debbie Reynolds at some angles. Katharine Kingsley was splendid as Lina Lamont. I wonder how she keeps up that screechy voice night after night. She got the biggest applause at curtain call for that amazing portrayal of Lina – most deservedly. The best part was probably the title song performance. It came with a real rain shower on stage! And, teehee, the people in the first few rows down in the stalls got splashed with water a bunch of times. I was especially amused by how they all shrieked in unison and then later, when the full cast performed the song after curtain call, you could see the people in those rows hurriedly taking out their coats to shield themselves from the inevitable splashes of water. Hehehe. So be warned if you plan to see it – don’t sit in the first few rows of the Stalls, unless you want to be splashed. 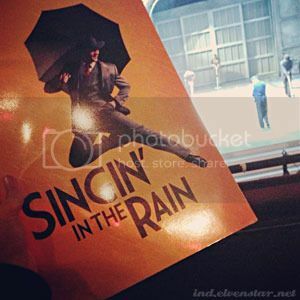 Singin’ in the Rain is really quite good. I think it probably beats Sound of Music and is on par with Reel to Real, if I was to rank it according to preference (which makes it… #5 or 6 out of 16, excluding local Malaysian-made productions).